The goal of the Ph.D. program is to prepare students for successful academic careers. Students learn in a stimulating and supportive environment that challenges them to grow and develop as researchers and teachers. We admit only a handful of new students in the fall semester each year because our Ph.D. program seeks to offer customized attention to each student. Our program provides benefits such as assistantships, tuition remission and health insurance. A statement of purpose discussing your area of interest in marketing, why you want to earn a Ph.D. and what you hope to accomplish with it. Your statement of purpose is to be submitted through Nebraska GAMES (Graduate Admission Management and Evaluation System) application system. Tips on applying to Ph.D. programs. Our deadline for receiving all application materials is January 1. Our department starts reviewing files for Fall semester admissions in early February. We do not admit Ph.D. candidates to start course work at mid-academic year (January). Since the university's Office of Graduate Studies has to verify and approve all transcripts and other application material before forwarding it to us, it is important to apply as early as possible. We take a great deal of care in the application review process to identify students that are a good match for our program and who we believe have the potential to make meaningful contributions to knowledge and the discipline of marketing. When your file is complete in all respects, it will be circulated to the Department of Marketing faculty for their decisions. Applicants for whom the faculty shows substantial interest are invited to spend a day with us on campus if possible. Final decisions on admission are normally made by April 15. You must register to take the GMAT or GRE and have the results forwarded to Nebraska (use institution code S40-HW-48). You must also submit your scores through GAMES. The minimum GMAT score is 650 for admission. Our strong preference is that you take the GMAT but we will consider GRE scores. The GRE score must be convertible to a minimum 650 GMAT equivalent. The International Student and Scholar Office provides orientation, counseling and advising to international students, and serves as the official liaison between your sponsoring agency and the United States government. Staff members are also available to help you make contacts on campus and in the Lincoln community. Our Ph.D. program is tailored to meet each person's needs, objectives, and prior course work. The program normally requires four years: two to two and a half years of course work, and the remainder in dissertation research and writing. In addition to the Department of Marketing courses, several research methods courses (such as statistics, research design, causal modeling, field research, etc.) are required. Each student must choose an outside area relevant to his or her interests (e.g., psychology, economics, sociology, etc. ), and complete at least four courses in that field. If the student's Masters level background in business and marketing is not strong, some additional courses in these areas may be necessary. The total semester hours required for the Ph.D. is 99 beyond the Bachelors degree, of which 20-36 usually come from the Masters degree. Nine of the hours are methods courses, usually about 20 are dissertation hours, and the remainder are courses taken in the Ph.D. program. Students are required to work closely with faculty members to develop first year and second year/comprehensive exam papers. These efforts are expected to culminate in submission to scholarly journals. Upon successful completion of the coursework, the papers, and the marketing review, students are admitted to candidacy for the Ph.D. and can begin work on the dissertation. Students will work with one or more of our faculty on their research, as a means of learning about the research process and the pursuit of new knowledge. Each year we assign each student a research assignment with one of our faculty members. Over the duration of the program, students will be expected to teach for four academic semesters. In addition, we try to provide opportunities for additional teaching in the summer, depending of funding availability. Currently our assistantship stipend for the academic year is $25,000 and includes tuition remission. More information about Nebraska’s health insurance can be found at http://www.unl.edu/gradstudies/current/health. We assign each student a first-year advisor, a faculty member to advise him or her on course work and academic life when he or she first arrives. A senior Ph.D. student is assigned to serve as a mentor and help a new student settle into the program. By the end of the first year, each student normally chooses a program committee to advise on course work. After being admitted to Candidacy, each student assembles a dissertation committee to advise on the dissertation research and writing. The Department of Marketing faculty members are highly accomplished. All have active research programs and have published in nationally and internationally prominent journals. Many have been officers of national professional societies and have chaired symposia, conferences, and conference sessions. Several have served as journal editors. Faculty members take a great deal of personal interest in each student, and give a high priority to their advisory role. We treat the Ph.D. students as junior colleagues in every way we can. The Department of Marketing works diligently to provide Ph.D. students with the resources useful to a graduate education. Each Ph.D. student, at present, has at his or her desk a personal computer with office software and access to the university servers, offering statistical packages, library access, and e-mail. Students are encouraged to submit articles co-authored with faculty to journals and to academic conferences; a portion of the costs for travel to a conference where students present a paper is defrayed by the department. An equally important part of the support the Department of Marketing provides is a scholarly environment. Several times in each semester, we have what we call "Brown Bag Seminars" -- lunch time discussions of interesting articles in our field. Also, several times each semester, faculty and students present their research at Friday afternoon research seminars. 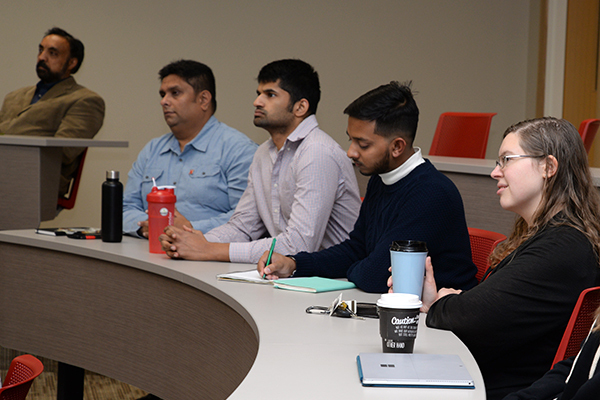 Throughout each semester we host our “Visiting Scholar Series”, inviting well known scholars in the field of marketing to visit and present their current research. In the Spring semester of each year, the department sponsors the Robert Mittelstaedt Doctoral Symposium, attracting doctoral candidates and faculty from the Big Ten and research universities west of the Mississippi River. Finally, there are informal gatherings and parties throughout the year which provide opportunities to interact outside of the office environment. Students takes foundational and research tool courses. Objective: By the end of year one, the student should be acclimated to the research environment, have a basic understanding of marketing theories and research methodologies, and be beginning to understand the areas they like or do not like so they can start thinking about areas of specialization. Student begins teaching undergraduate courses in the Department of Marketing. Objective: By the end of year two, the student should be gaining competence as a researcher, should have a deeper understanding of marketing theories and research methodologies, and should have identified a general area of specialization. Student forms dissertation committee and begin developing dissertation proposal. Continues as a Research/Teaching Assistant. Defends dissertation proposal in the spring. Objective: By the end of year three, the student should have defended their dissertation proposal, begun to establish a research program, gained teaching experience, and be ready to go on the job market. Student collects and analyzes dissertation data in the fall. Interviews for jobs in fall. Defends dissertation for spring or summer graduation. Objective: By the end of year four, the student should have completed their dissertation, accepted a position as an assistant professor, gained more teaching experience, and have a solid pipeline of papers to take into their first job as a tenure-track faculty. This option will be offered only with faculty approval.